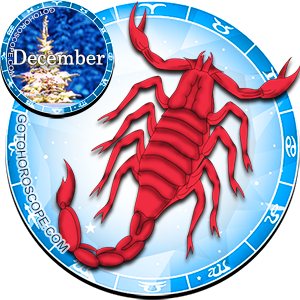 December 2015 Horoscope Scorpio, free Monthly Horoscope for December 2015 and Scorpio Astrology Forecast for the month ahead. The zodiac sign in which the Water element is going through a stage of its highest development will be in a very positive situation in December 2015. Probably at this stage of life, Scorpio will really be one of the most successful and lucky signs. But this is not to say that you will have nothing to do, on the contrary - the more effort will be invested in the solution of a problem - the more positive will be the result. All honest. Saturn, the planet-exalt sign of Scorpio, will be repeatedly reinforced by his interstellar situation arising from a unique confluence of stellar circumstances. As a result, the Scorpios will receive strong support, not only in terms of vital resources, but also in relation to specific issues. However, Mars (the planet-ruler of Scorpio) - traditionally characterized by a violent temper will also acquire additional astral gain, the result of which is actually not so easy to predict. After all, the Scorpio has a nature that is rather ambiguous, so perhaps this month the people born in this sign will find it necessary sometimes to restrain themselves. The negative influence of Venus, responsible for the expulsion of the Scorpio, is unlikely to cause any strong development of events, especially when you consider that the Moon (responsible for the fall of the sign) will be its celestial leader, completely shielding the lion's share of third-party negative emanations. Thus, the working direction of December 2015 will be successful for the zodiac sign of Scorpio, but with some reservations. Firstly, under any circumstances, try to control your emotions, which at this moment can be destabilized by the negative influence of Venus (albeit weak) and the positive influence of Mars (extremely strong). It is therefore not necessary to address your issues in a raised voice, now that the raging celestial warrior is entirely on your side, which means you need a minimum impact to make the opponent retreat. Minimum impact, but still thoughtful, competent and harmonious in all respects. Despite the fact that you will feel your hands scratching for some violence, try to solve all questions diplomatically and in any case did not go make it personal. If, however, the situation is out of control, there is no reason to stay, although remember that there may be far-reaching consequences. To a lesser extent, this applies to those who work for themselves. Nevertheless, all Scorpios still need to be a bit more collected than usual. The rest cannot be limited by anything but yourself and you will have all the necessary resources to solve current problems. In terms of personal relationships, it is necessary to mention the fact that in December 2015, Venus will have a weak, but still a sizeable impact on the sign of Scorpio. This was already mentioned, but it is in the field of feelings and emotions that the influence of the treacherous Priestess of Love will be the most active. To ensure that everything is going as you have planned it, you will need to follow two simple rules. Firstly, do not hesitate to ask and specify over and over again, in any case, do not allow ambiguity and innuendo, especially if you are the organizer of a major event. Secondly, never put your own desires above the desires of those who are dear to you. In principle, this point is relevant in almost any situation, but now the stars recommend that you pay special attention to it. In the rest, there can be no doubt that the circumstances will be completely on your side and you really do not need to be reinsured. I should have read my horoscope sooner. Not my best month at all. Venus has the best of me. HI,All the very best SCORPION ppl. My dob is 1984 , still i never get success in my life. Any astrologest can help me please free of cost.i cant pay you fee. my carrer and my life.